If you have a link you would like us to add, please feel free to e-mail us, and we will include it - if any links are out-dated, let us know about them too!. Please note the links open in a seperate window. 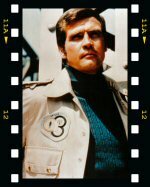 The Unoffficial Lee Majors Page - Excellent site devoted to Lee, run by Cubester, a great lady and good friend. Well worth a visit. Plenty of photo's of Lee from college through to present day. Updated regularly. The Big Valley - Lots of background on the show, it's stars, and just how "true" to the Old West the show really was. Plenty to read and look at. Well worth visiting. The Barkley Library - Site devoted to fan fiction for The Big Valley. Plenty of stoires to read, and you can choose by character, type of story, or author. Also includes a Writer's Guide handbook, for anyone wanting information on how to write a Big Valley story. Also check out The Holding Pen for over 400 BV fanfic stories to sate all your Heath Barkley needs! The Bionic Page - Archived version of the "official" SMDM page on the Sci-Fi channel, maintained by Rod Rehn. Good source of background info, trivia, and photo's. It hasn't been updated in a couple of years, but is still one of the best Bionic sites around. The Bionic Woman Files - A great Bionic Woman resource site. This site has recently had a make-over and now features additonal audio and video clips - a must for any BW fans. Bionic fans @ YahooGroups - Informative, fun, talkative and sometimes controversial [but NEVER boring] Email-based discussion group on SMDM & BW. SMDM Vs. Robocop - A light-hearted "What If", for the ultimate Cyborg grudge match. Hombre Nuclear - Argentinian Six Million Dollar Man site, check it out! The Fall Guy - A German site dedicated to Colt and the gang. Plenty to check out, everything from FAQs, to video and audio clips. There are so few sites devoted to FG, you can't not drop by for a visit. The Raven Shrine - The best Raven site around! Interviews, photo's, audio and video clips, and just anything else you could want on the show. Jeffrey Meek Studio - Official site for jeffrey and his acting classes. Jeff runs various workshops and classes, all the deatils are here, along with biographical and career info on the actor. Christopher Franke - Official site for the composer of the music from Raven. Lot's of information about him and his music. Definitely check it out. Tour of Duty Info Page - Includes comprehensive episode guide for the show as well as character bio's and various links. Fansource: Lindsay Wagner - Details of how to join Lindsay's official fan club for newsletters, photo's and the usual benefits. Kenneth Johnson - Official web site for the popular and prolific creator of Ther Bionic Woman. The site has dedidcated pages to many of Kenneth's most popular shows: BW; V; Alien Nation and The Incredible Hulk, to name a few. With many candid and personal photo's included, this is a must-visit site for fans of the man's work! Barbara Stanwyck: The Queen - Superb site devoted to Barbara and her long career. Includeds rveiws of her work as well as books and articles written about her. A great resource for fans.